The extent of information on the site, and the way it is presented, is exemplary. You can find boxes by dimension, item number, or just by browsing lists in order of ascending size. Finally, you arrive at an individual spec page for every box showing a photograph and every other kind of detail you need so there is no mistake about exactly what you are getting. The fact that information is presented visually as well as in tabular form is very helpful to that large section of the public that is right-brained like myself, and who can easily get lost in lists of numbers. Within the understanding that this site really works well, I did come across what was a graphic problem for me. 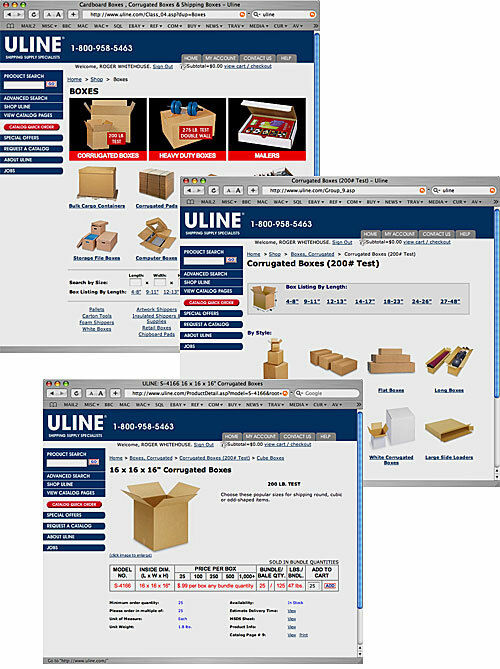 On the first page in the illustration, which is the header page for the boxes part of the site, I had trouble finding the regular corrugated box section, until I discovered it featured at the very top. The problem is, that elsewhere on the site all the specific navigation choices are images nicely silhouetted against white and I was looking for one of these. Subliminally, I had assumed the much more “noisy” trio of images at the top were specials or come-alongs of one kind or another. For me, this is an important example of how it is important to set up a graphic “language” for a site, and then stick to it. In this way, users “understand” the site by an underlying graphic structure rather than having to reason their way around. Picky, Picky, Picky.